‘Colossal’ is one of the strangest films to describe this year, and even more so to sell it to someone. It’s a peculiar piece of cinema from Spanish director Nacho Vigalondo, which blends a fantasy monster movie with a black comedy about alcohol addiction, and in some quarters I’ve seen it described as ‘Godzilla’ meets ‘Rachel Gets Married’ (the second one I’m sure in no small part thanks to Anne Hathaway’s starring role). The film focuses on Hathaway’s Gloria, a self-destructive writer who heads back to her hometown after her boyfriend (Dan Stevens) kicks her out their New York apartment as a result of her excessive drinking. Shortly after arriving home and reconnecting with an old friend from school (Jason Sudeikis), a giant monster starts attacking Seoul in South Korea, and Gloria thinks it has something to do with her. It sounds ridiculous but ‘Colossal’ just about manages to make this outlandish premise work! It’s testament to the sharp script and smart observations that ‘Colossal’ makes it as far along as it does before the premise starts to collapse in on itself, and for the majority of the film, this is a really enjoyable black comedy with a lot to say for itself. The film explores the nature of alcoholism and addiction through both the high and the low points, and in many respects the introduction of a destructive monster that hurts those around it acts as a giant metaphor for a smaller scale exploration of that topic. It’s pretty funny throughout, often due to the camaraderie between the performers, with Hathaway making Gloria a character worth rooting for and Jason Sudeikis in particular as good as he’s ever been. He’s a revelation in a performance that initially plays on his previous roles as a funny and charming love interest, before he switches tack subtly to show off a nasty streak that ‘Colossal’ begins to explore through the latter part of the film. 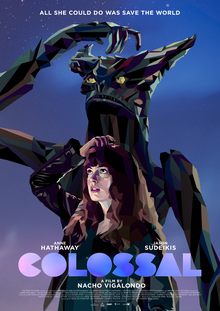 It did make me feel uncomfortable at times, but I liked that ‘Colossal’ wasn’t afraid to explore some darker material, and it is especially good that it doesn’t retrofit a Hollywood ending, instead following the material to a more fitting conclusion. ‘Colossal’ is unlike anything you’ll see in cinemas this year (and probably longer), a truly original piece of work that blends disparate genres and topics with a genuine level of skill and flair. It’s not perfect and the sheer oddness of its premise may prove off-putting, but I do hope it finds an audience and it’s well worth checking out.